This project included the inspection of all truss fracture critical members, all floor system members located directly below deck joints, all floor connections to the lower chords in tension zones, all pins, all fatigue prone details, and areas of significant problems noted in previous inspection reports. In addition, each bridge received a walk-over deck inspection. 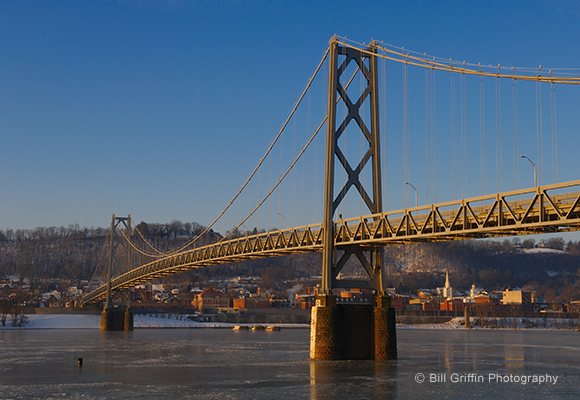 The four long-span bridges in this inspection, located from Paducah, KY, to Newport, KY, encompassed a variety of bridge types, including suspension, truss, through truss, and cantilever through truss. The bridges vary in length from 1,850 to 5,385 feet. Inspections of the I-65 (Kennedy) Bridge over the Ohio River at Louisville, KY, and the US-27 (Taylor-Southgate) Bridge over the Ohio River at Newport, KY, were completed in 2010. The bridge inspection reports included condition ratings in accordance with NBIS, summary of significant findings, and recommended repairs. The inspections of the US-45 (Brookport Bridge) at Paducah, KY, and the US-62 (Simon Kenton Bridge) at Maysville, KY, were completed in 2011. The bridge inspection reports included condition ratings in accordance with NBIS, summary of significant findings, and recommended repairs.